I can’t tell you how many times I made the drive, sometimes local, sometimes distant, only to find the trout stream over the banks. Doesn’t stop me from fishing but I know right away the odds are not going to be good. Main problem: fish won’t see the lure cruise by in deep water, meaning 3+ feet , particularly if the water is stained or muddy. Trout hug the bottom. 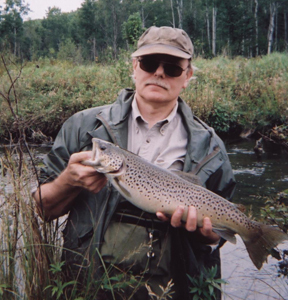 It helps to know the stream well so you can cast to shallow areas and increase the odds of fish spotting the lure. I usually cast a large floating minnow hoping fish will see it wobble by. I put on a deep-diver, occasionally, selectively, if I am pretty sure I won’t get hung up on a sunken log. So that was the scene on Saturday. 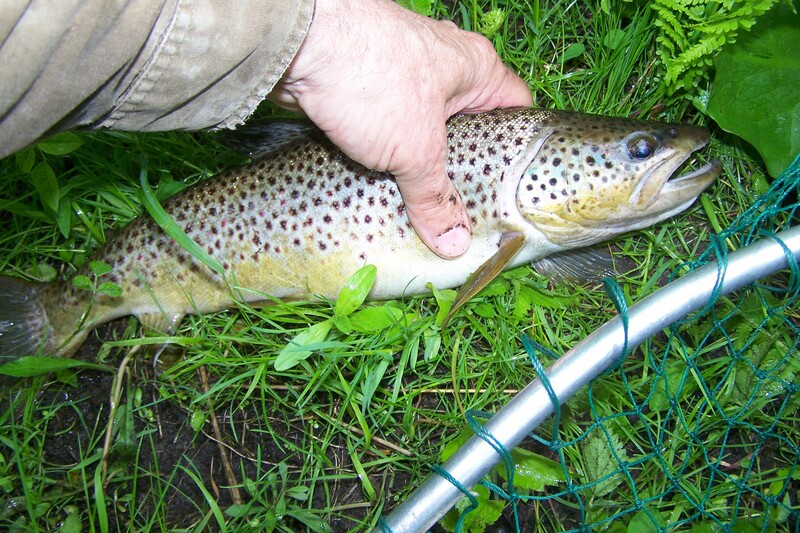 I finished off a work project in the morning, threw my waders and gear in the SUV, and hit my local go-to stream for brown trout. No cars parked at the trail entrance so I suited up, sprayed on some deet, and made the walk downstream to my put-in spot. 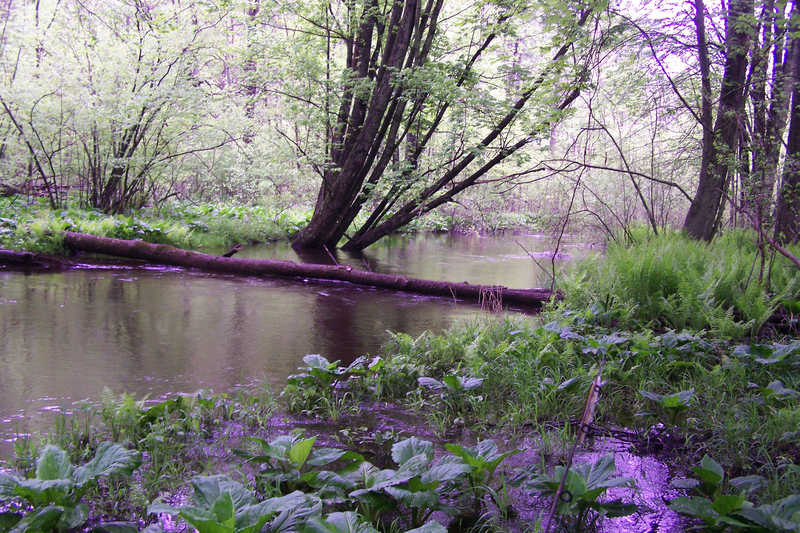 This stream is usually so shallow you can step in but to be safe I sat on the bank and slid in. About 3 feet deep. And dark, The lure disappeared less than a foot down. That said, right off I caught a fish about 16 inches. Started getting some follows too. Nice fish. They would porpoise near the surface at the rod tip. I waded where I could but had to figure out as I went along where I could cross the stream to access the best casts and cover. So there was a lot of getting in and out, seeing if I could cross, and casting from the bank. I was seeing enough fish to keep it interesting and could feel a bump once in a while, fish bumping the lure but not getting hooked. After an hour I had caught and released four fish and kept thinking – in one or two days this stream is going to be perfect. Easy to wade, clear enough water to see what I’m casting into, and ready to give up some huge trout. So I quit after about an hour, not really discouraged, but knowing the timing of this trip could have been better. I zig-zagged back downstream along the bank figuring that would be the easiest path back to the car. Not sure if I will make the trip again in two days but the whole summer is ahead. I hope to do a lot more trout fishing this year.